As part of our long standing friendship with Aston University and its student body, Majestic were honoured to sponsor the Computer Science Society’s first official Hackathon, AstonHack (in association with MLH). We were awstruck by the talent on show, and humbled to be a part of such a great event. AstonHack was great, not only for the variety of “hacks” ( showcased here on devpost ), but also for the quality – with several feeling very close to a finished product. We had four parrot drones to give away to the best hack using the Majestic API, which may have been part of the motivation behind the widespread adoption of our API. Despite being introduced as an API to a map of the web, Majestic found it’s way into a variety of hacks. 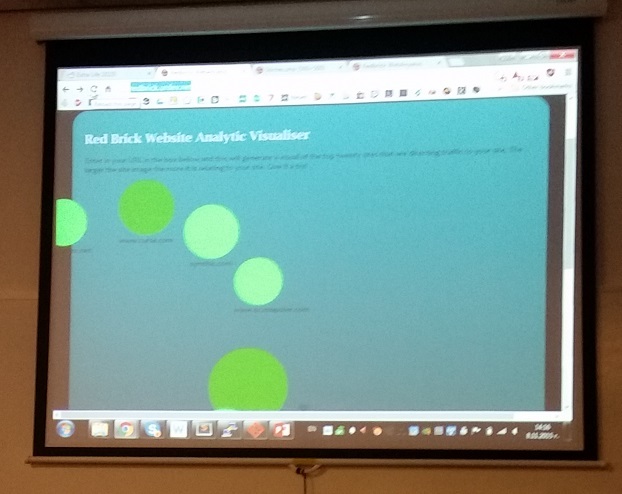 BCU team Openteach produced a tool to link volunteer experts with communities and events, using the Majestic Topical Trust Flow to analyse volunteer social media profiles to illustrate interests. Openteach were rewarded with “best AWS hack” for their efforts. 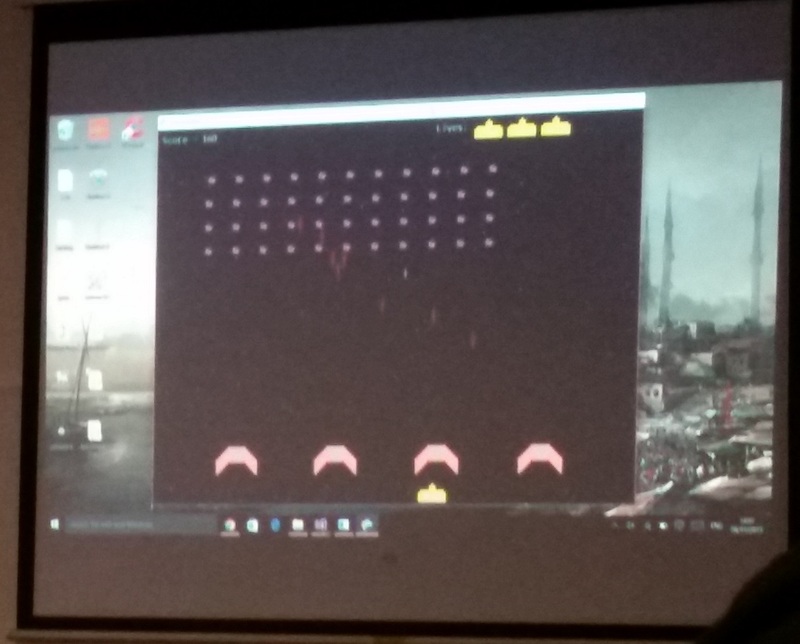 Another BCU team produced “Game Your Data” – an imaginative unity of the classic invaders from space games and Majestic Data – using a retro classic to illustrate the various metrics provided by the Majestic API. 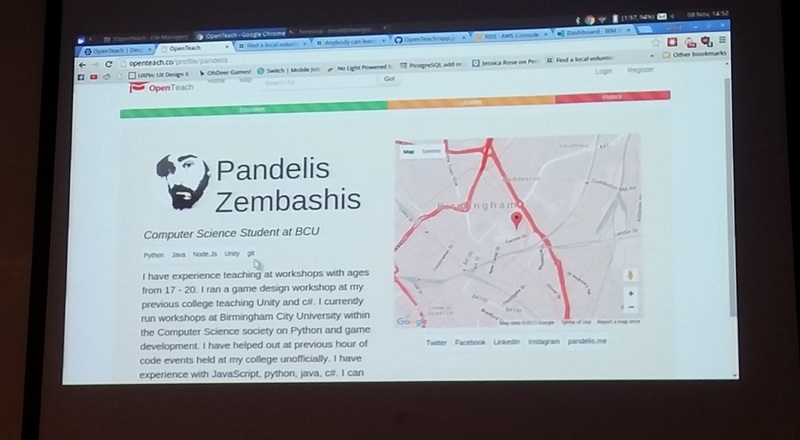 “Game Your Data” impressed the judges, and was awarded one of the three #AstonHack prizes. Continuing on the fun theme, BrumHack organiser Jack Wearden levered the strengths of our fresh and historic indexes to create “2007 Financial Crash Administrative Takeover Simulator 2015 MMO RPG” – a multiplayer bidding game that encourages players to back companies in the last financial crash. Tom Galvin followed with “M’pointless” – a tribute and celebration of a popular TV show, using Majestic data to power an online quiz. Data visualisation was a popular theme at AstonHack, with “red brick” “trending internet” “Data 2” all providing interesting interpretations of Majestic Data – “Data2” using a retro “turtle” style to display website information, Red Brick using our API to generate circles of influence which were annotated with screenshots, and “Trending Internet” creating an interesting fusion between Majestic data and Cap Gemini visualisation tools to show internet trends. Involvement in hackathons, if done with integrity, is about more than just highlighting projects using your own API, and it’s fair to say that there were a number of projects that caught our eye over the weekend. 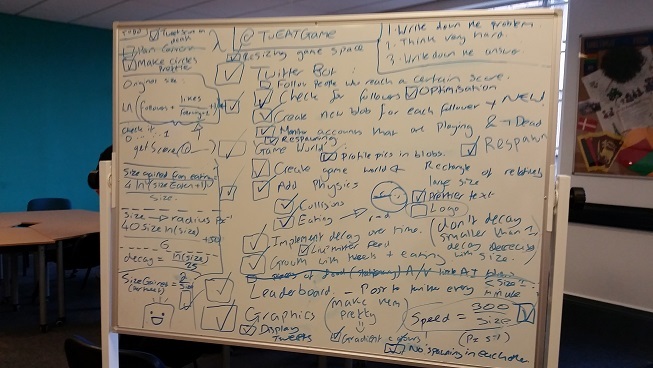 TwEAT – a game inspired by Agar was impressive – not only for it’s intresting combination of visualisation and influence based game engine, but also for the way it was developed – unusually for a hackathon, the team employed a project manager, and made healthy use of a white board to plan their product development. Clever planning allowing twEAT to deliver a very polished App. GnomeChild 2.0… How best to describe Gnomechild? Should one opt not to download gnomechild from the Android store, it is best described as a caricature on the mobile phone PDA. A blend of dark wit and uncanny high pitched gnome voice, waiting to handle your queries. AstonBall was a stunning interactive football game, which empowered a team of players to turntheir mobile phones into joysticks to engage in an online game hosted totally in the web browser. There were more stunning hacks – a visualisation of warcraft won a prize for best newcomer, a proposal for a crowd of low-cost drones to map Severn Trents inherited pipes, a new email client with an embedded CLI, misconstrued – a retranslator to manipulate both image and text content, dungeon crawler – an impressive virtualisation of wikipedia data, safe drive – a utility to automatically contact parents when arriving at a destination, and many more… Judging was tough. A huge shout out to the hardworking organisers, who have worked hard for months to get #AstonHack off the ground. Aman, Beth, Hassan, congratulations, and thanks to you and your team of exceedingly hardworking volunteers and co-organisers for a really excellent event. We appreciate the opportunity to have been a part of it. Our partnership with you has allowed us to make a difference to changing perspectives about the ability to innovate and make a difference, and enjoying the experience of working with like-minded individuals and organisations. Thanks for your continued support of the CS students at Aston, and with this event, from around the country. Aman, thanks for the very kind words. We all massively enjoyed the event, the enthusiasm by you, your team of organisers, and the attendees was fantastic – and I am positive that we weren’t the only industry partner to be engufled by the positive can do atmosphere which was so abundant at your hackathon. On both a personal and professional level, it was a privilege to be involved, the event was a credit to yourselves as organisers and your university as a venue. Just wanted to say, as someone who went along just to see what hackathons are like, I was quite amazed. It was inspiring to see the enthusiasm shared amongst the organisers, sponsors and participants, which the range and quality of the outputs reflected. Well done, and many thanks to all involved. Thanks Dan – it was really an amazing event – Unfortuntely this link missed the cutoff for the event, RebelUncut made a cracking video telling the story of the astonhack.